Farmersville Equipment, Offering new and used tractor parts and literature.Bolens, Oliver. A really cool site guy's even has awesome pedal tractors.Check it out!!. A very Nice Wheel Horse site with lot's of Info. A real cool Bantam Tractor Site. A real Nice Wheel Horse Site. A real informative Garden tractor page. A nice site for speedex owners. A new look for cub cadet. HAPCO,If your restoring your old john deere's then this is the place to go. WEEKEND FREEDOM MACHINES,A great place for info on john deere garden tractors.One of the nicest group of people around.If you need help with your JD trust me these guys can help. JOHN DEERE TRACTOR CLUB,This is a great club to join,they can help you with any info you need. ANTIQUE TRACTORS.COM,A great site that covers all types of tractors from cub cadet to allis chalmers. CUB CADET PULLING TRACTORS,This site specializes in your cub cadet puller guys.Lots of parts. MILLER TIRE.COM,This is another site for pullers.Lots of puller parts aluminum wheels etc. KEEPING IT GREEN,A site that sells a lot of john deere stuff,paint,hats,shirts,etc. OLD LAWN MOWER CLUB,A site for really old mowers some great info here. FARMALL CUB,A site dedicated to mostly the old farmall cub. Another Cub Cadet Page.cub Decals Cub Toys etc. 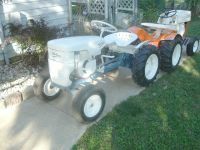 ANOTHER CUB CADET, lots of info on old cubs. ORIGINAL FARMALL,A site with a lot of misc. stuff from muscle cars to tractors to motorcycles. Misc.SMALL ENGINE STUFF,A site for just about anything small engine,ATV,Snowmobile,Mini Bike etc. Cushman Group a real nice bunch of people sharing info on cushman scooters.